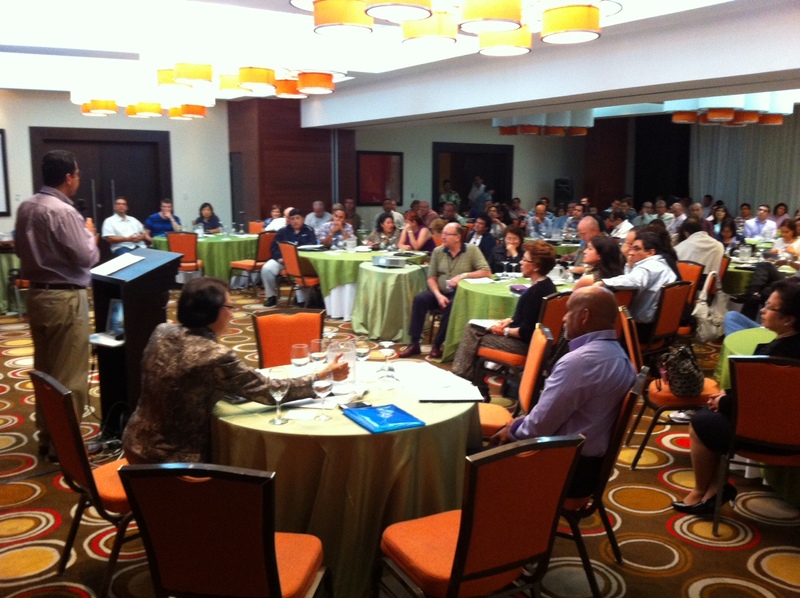 Considering the small coordination team, the short length of time to plan the event, and the lack of precedence in Latin America for an event like this, the first-ever DNA Regional Forum for Latin America was “even better than expected” with “electricity flowing through the room,” some attendees said. More than 140 people from 16 nations, including a few from Spain and the US, converged upon Panama City September 10-13. The largest delegation–about 50 people–came from Peru, with Colombians composing the second-largest group. The crowd was filled with many very influential leaders like Pastor Hector Pardo from Colombia. Those who came to the Regional Forum for Latin America either were invited by a friend, had read Discipling Nations or If Jesus Were Mayor, or knew about the DNA from seeds planted in the region over the years through Vision Conferences and other seminars. “There was a lot of energy from the group and a sense that the prayer and seeding over the years is coming to fruition. Many people said this was a kairos moment for the Americas,” said DNA co-founder Darrow Miller. What was the agenda for the conference? The morning sessions were spent sharing about the DNA: vision, mission, operating principles, core truths and other central DNA messages. In the afternoons, delegates split into groups by country to pray and strategize together. Every evening, DNA practitioners like those from AMO or the Nehemiah Center shared about God’s work through their ministries. Meals were spent in a buzz of fellowship with old friends and meeting new friends. What new things did people learn? Yarley Niño, a member of DNA’s Global Leadership Team, the contact person for the DNA in Puerto Rico and the woman who spearheaded this forum, repeatedly stressed that with this movement, there is no power nor salary–only work. Several volunteers stepped forward to form new Local Networks of the DNA in their home countries. Specifically, Peru, Colombia, Chile and Mexico had strong delegations of believers who expressed their desires to advance God’s kingdom by spreading DNA teachings within their own circles of influence. These groups each were prayed over by the rest of the forum’s delegates, and we ask you to join us in praying for their attentiveness and obedience to God’s instruction as they move forward and organize. This is how the DNA “virus” spreads–by grabbing onto the hearts and minds of hosts who takes the teachings and “infect” others with it. Read about how this happened in Africa here and here. Also, many delegates discussed hosting a follow-up Vision Conference and Training-of-Trainers session for forum delegates to attend with key young leaders they know. If you will, please also pray for this effort as well!